Made in the USA. Commercial Quality – Built to Last! 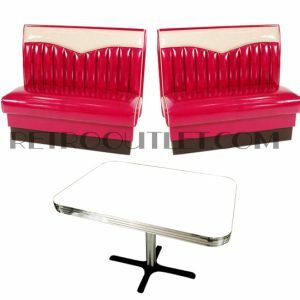 The Serenade Diner Booth Set is a fully upholstered booth featuring diamond tufting and 36″ overall height. This complete set includes 2 diner benches, 1 table top with real metal banding, and 1 Classic Chrome Column Base. This set can easily transition into a more contemporary environment with your fabric and laminate choices. Please allow 4-5 weeks for production of the Serenade Diner Booth Set in your choice of colors.